Ideally suited for upscale environments, the European Series trash receptacles feature clean lines, heavy gauge black powder-coated fire-safe steel and an elegant brass finish. The exceptional durability provides a low-maintenance solution for prominent areas. All receptacles feature protective vinyl trim on all side disposal openings, and a bottom rim designed to protect floors. Half round receptacles are designed to be placed against the wall for areas where space is limited. Lift-off body facilitates emptying of leak-proof galvanized or rigid plastic liner. For indoor use only. Vinyl Trim Around Disposal Opening. Aluminum sand urn tops are removable and coated with a "mar-proof" epoxy finish which is resistant to cigarette burns. Models CC16-10B and R1536-10B are UL Listed, FM Approved as fire-safe self-extinguishing. Model R1536-10B features a self-closing door, which complies with OSHA Standards, and recessed hand grips for easy lift-off emptying. 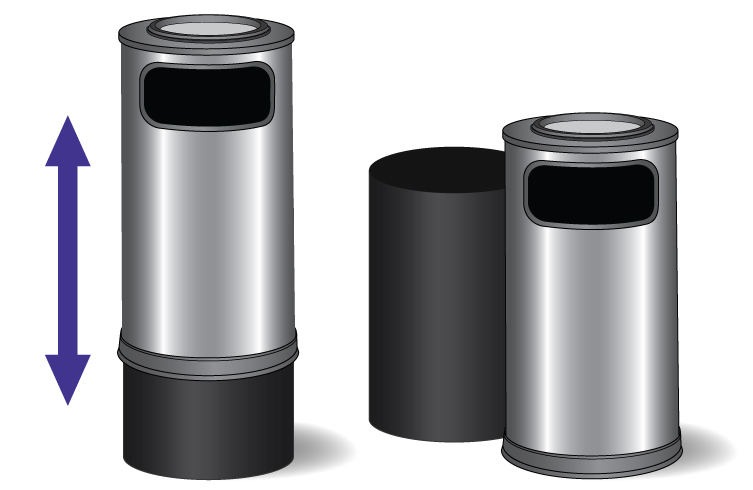 These trash receptacles have exceeded EPA guidelines for post-consumer recycled content (30% for steel and 70% for aluminum), and assist in obtaining LEED® credits. This means that you can feel ecologically responsible knowing that when these trash receptacles reach the end of their useful life, they are recyclable!